A+D and Payroll present the greatest mashup party in the universe! ONE NIGHT ONLY ... Bootie London is back! Click button above to stay informed about our next party! At the end of Torrens St, just off City road around the corner from Angel tube station. A funky warehouse location, over 3 floors, with cheap drinks, great tunes and friendly staff. FREE Bootie mashup CD to the first 100 people through the door! DJ set with live vocal mashups in the mix! 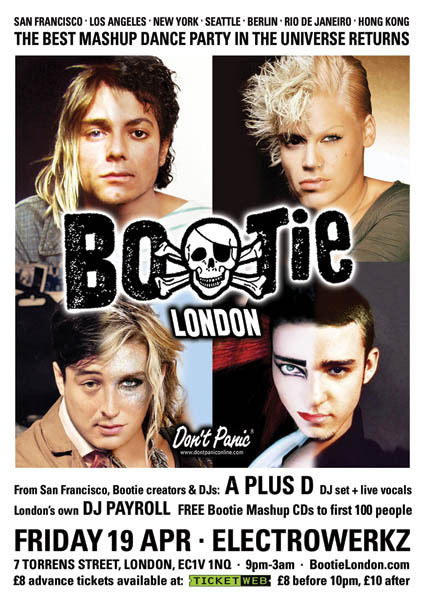 On Friday 19 April, 2013, BOOTIE, the international club brand that has helped popularise mashup culture around the globe, returns to London -- the spiritual birthplace of the modern mashup movement -- for its fourth party at Elektrowerkz. 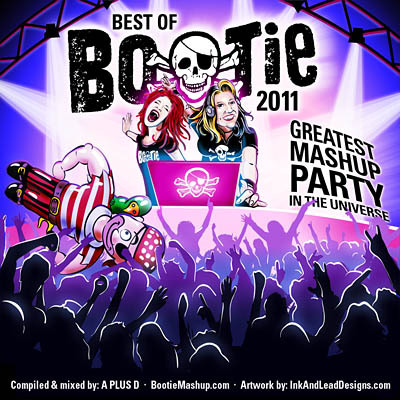 Launched in 2003, BOOTIE was the first club night in the United States dedicated solely to the then-burgeoning artform of the bootleg mashup -- and has since become the biggest mashup event in the world, with parties in several cities on four continents including San Francisco, Los Angeles, New York, Berlin, Hong Kong, Rio de Janeiro, and many more, as well as one-off Bootie events from Beijing to Bangkok. Headlining this night of mashup mayhem will be the club's creators, San Francisco DJ duo A PLUS D, who, for the past ten years, have become internationally-known as not only tireless torchbearers of the mashup genre, but bootleg producers and performers in their own right. In addition to DJing, they also add a live element to their sets, as DJ Adrian (who also fronts live mashup band Smash-Up Derby) takes the mic to sing a few mashups live! As the SF Weekly wrote, "Committedly unpretentious and ready to rock, A Plus D deliver the perfect remedy for the occasionally snooty, often staid dance scene." Bootie keeps one's brain guessing and body dancing with creative song combinations, as the party celebrates -- and satirises -- many different forms of music. Mixing and mashing every musical genre, era, and style into one big dance party where everyone feels welcome, Bootie provides the soundtrack for the A.D.D. generation -- with free mashup CDs given away like candy --- and a special Bootie London edition will be given to the first 100 people through the door!